By the time your puppy is 3 months old, he’s starting to thrive in his puppyhood. He’s becoming more coordinated and confident and hopefully socializing well with other people and family pets. Your pup needs your attention more than ever during his third month. He’s continuing to bond with you and requires lots of play sessions and exercise. He’ll also need a visit with his veterinarian and plenty of good food, sleep and snuggling. By the time he’s 3 months old, your puppy will be extending his play sessions longer in-between naps, but he’ll still require plenty of rest and good quality food. Your puppy’s brain development is critical during the first year. It’s important to provide him with a high-quality food that is specially designed for puppies. Large breed puppies should eat puppy food for the first two years of life; small and medium-sized dogs can switch to adult food after one year. Give your puppy three meals per day, feeding him the amount your veterinarian recommends. Provide your puppy with plenty of chew toys so he can satisfy his urge to gnaw on something other than furniture. A smart toy, such as the Kong, keeps your pup busy as he tries to manipulate it to get a treat. In addition to solitary play with his toys, your puppy should spend plenty of time playing with you. You can start teaching him basic commands and tricks, and play games like fetch. 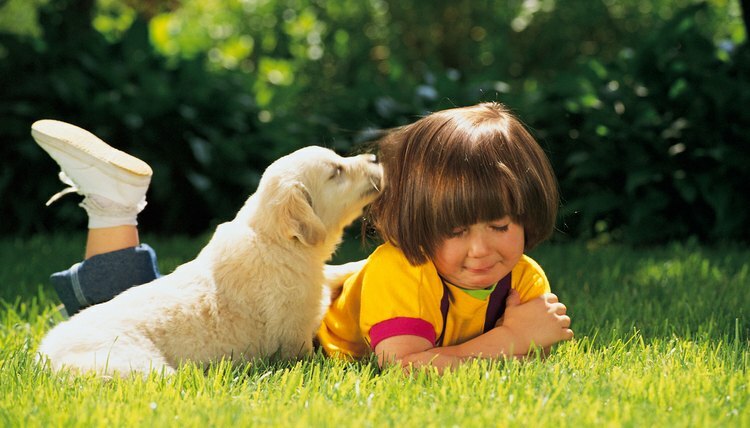 If your puppy is playing outside, ask your veterinarian to recommend a good remedy for flea and tick infestation. Your puppy’s crate is an ideal spot for napping and sleeping at night. The crate should be just large enough for him to stand and turn around. If you buy a bigger crate so he can grow into it, place a rolled-up blanket in the end so that he doesn’t have room to eliminate in it. Place a soft blanket or towel on the floor to keep him comfortable. As the owner of a puppy, it’s your responsibility to ensure that he’s as healthy as possible. That includes vaccinating him from dangerous and even fatal diseases. Some states require certain vaccines, such as rabies. Most puppies receive a series of vaccinations to prevent parvovirus, distemper, hepatitis and rabies. Your veterinarian may recommend other vaccinations. For instance, the Bordetella vaccine, which prevents kennel cough, is often recommended for pups who will be boarding at kennels while their owners are out of town. Talk to your veterinarian about a vaccination schedule. Most vets provide a series of three combination vaccinations beginning when the pup is 6 to 8 weeks old. The vaccinations should be received three to four weeks apart. Until he’s had the full series of vaccinations, your pup is not fully protected. Your pup should receive his second round of vaccinations during his third month. If you haven’t visited the vet for vaccinations, it’s not too late to start. At 3 months old, your puppy is starting to gain some bladder and bowel control and should be able to start alerting you if he needs to eliminate. Effective housetraining requires vigilance and consistency. Crate training is an effective way to minimize accidents and help your puppy understand that he can’t use your front room floor as a bathroom. It’s important for 3-month-old puppies to get plenty of socialization, both with people and other dogs. Your puppy’s vaccinations aren’t yet complete, so it’s not safe to take him to a dog park or other public place where he might be exposed to dangerous illness. However, many puppy day cares have a special puppy room for youngsters. As long as he’s current on his vaccinations he can play with other puppies who are current on theirs. He’ll learn how to negotiate playtime and grow up less suspicious and nervous of other dogs. Enroll your pup in a training kindergarten so he’ll start learning his puppy manners. Puppy kindergarten classes may be taught one-on-one with just your pup and an instructor, or in small groups with puppy owners handling their dogs. How Long Can Dogs Go Without Sleeping?